We are all flowers. Some of us are lilacs, others a daisy, but regardless of how we appear and our genetic classifications, each and every individual in this world has the potential to do great things. While we only have a few buds on our stem, those small curls of green can have the potential to become beautiful, dynamic flowers. This seems simple. A flower needs pretty basic things: water, nutrients, light, and the proper environment. Unfortunately our process of blossoming isn’t like a flower’s. Unlike the passive flower, we can create change within others and ourselves. However, sometimes we need a little guidance. A person, event, or in this case a camp, to really make us look at who we are and what our purpose is; how to properly serve, support, and lead others. How does one have such a transformative experience you might ask? The answer: go to Leadership Camp. 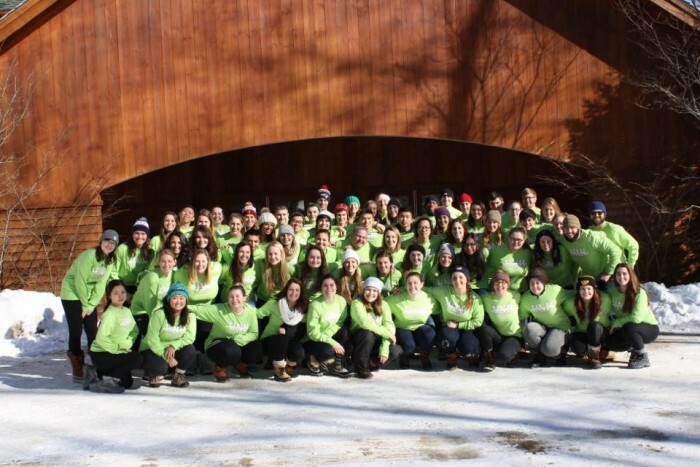 I, along with 57 other leaders, took 5 days out of my winter break and disconnected from the world at Camp Merrowvista. Although it may seem intimidating at first to enter a place where opening up to others is almost contagious, the atmosphere is unlike anything I’ve experienced before. At the end of the first day it was as though hours were days and strangers were high school friends. After 9 hours of meeting new friends, we accomplished far more than I would have imagined. Of course the day was filled with icebreakers within the whole group, as well as in our smaller action packs, but more importantly we looked at who we are as leaders and who we want to be. This was the start to a week filled with self-reflection. Day two festivities started almost immediately after lifting our heads and filling our stomachs. Divided into small groups, we headed to the ropes course. Like many other students I’ve done ropes courses before, but never has there been this much chemistry between a groups of people. We untied our human knot in a matter of minutes, navigated through a spider web of ropes, completing the task without setting off any bells, and successfully lifted 12 people over a 13-foot wall. Upon reaching the wall we all had the same reaction of disbelief, they are having us do what? This isn’t going to happen! We all thought it but no one said it. Instead, each member of the team listened, planned, and acted to efficiently make this doubt a reality. We learn how incredibly true Helen Keller’s quote, “Alone we can do so little. Together we can do so much” is. Without that team of people, we as individuals would not have been able to get over the wall that once seemed like a daunting task. As soon as the last person made it over, we all felt so empowered. If we could conquer the wall, what couldn’t we conquer? It wouldn’t take much longer for us to approach past walls unclimbed. We all have events, emotions, and thoughts that we’ve hidden from the world for various reasons. However, this was about to change. Sitting around a circle with five random people, we each spent a few minutes spilling our deepest secrets saying, “If you really knew me you would know that…” Speaking as someone who likes to shelter these things, there was something about sitting around that circle that made me feel comfortable. By the end of the activity the air was heavy, but our minds were lightened. Leaving those burdens behind, we were able to clearly think about what kind of change we wanted to see in the world as we made our way into working on our leadership action plans. These are our visions for the future and how we will reach that kind of world through specific goals. The task seemed daunting but we spent a large part of the rest of the week working on establishing a solid set of steps towards reaching those goals. The next three nights we were left thinking about these plans and the future. morning with them, and the afternoon was spent building stronger relationships with fellow campers. The fourth and final full day was spent primarily working on our action plans some more and reviewing everyone else’s. It was a great opportunity to see what the others were passionate about and to help them with their potentially impactful pursuit. The seriousness of that day quickly changed once night rolled around. As an action pack we created a skit about one of the lessons taught throughout the week. My group got, enabling others to act. We created the “cornbread clique”, a very closed-minded cornbread-loving group. However, through some eye-opening conversations, the clique quickly became inclusive to those who loved whole-wheat toast and other varieties of bread. Though this skit contained much laughter, behind it all was a serious message about how to positively influence others to stand up for what is right. Leadership camp shined some light on our blossoms. Even though it was only five days, by the end of the week it was easy to tell that we, as people and leaders, had changed. We felt empowered, like our voices could have an impact on the world because our voices could lead an army, and our actions could start a movement. We were all ready to get back to UNH to start a movement within the community. Personally, with my new found confident voice I was ready to be heard in my Igniter group (a subcommittee in the FIRE program) because there was a presentation in front of the Foundation and Alumni board just a few days later. Further more I was eager to start a moment in my FIRE class and my peers were ready to do the same in their organizations. Not like the passive movement flowers have when they sway in the wind; we are more than that. We are the focuses of wind moving the flower and helping blossoms develop. If leadership camp has taught me anything, it is that our voices and actions can have more of a positive impact than we realize, we just need to learn how to use them to their fullest potential. We as leaders need find what makes us blossom. Emily Grone is a motivated first-year student at the University of New Hampshire where she studies Business Administration, hoping to focus on marketing and management. She graduated from Gorham High School as salutatorian with the presidential scholarship to UNH. Grone was very involved in her high school as president of her class and National Honor Society along with being vice president of student council and chief editor of the yearbook. In the summers, she owns her own ice cream shack called Scoggins Cool Shack and will return this summer as her 4th year operating the business. Currently at UNH, Emily is involved in student senate, women in business, and net impact. She is also part of the Igniters group. As a first-year business student she was part of a FIRE class and was recognized as a leader in her class, so she was chosen as an Igniter. These are the students who act an advisory board to help improve the program and motive more students. She is excited to see what the future has in store for FIRE.